Harikatha (lit. stories of the Lord) is the exposition of a religious theme, usually the life of a saint or a story from one of India's scriptural texts. Its purpose is to spread devotion to the Divine. Harikatha is a composite art containing story-telling, poetry, music, drama, dance, and philosophy. Any story about God, or scriptural incidents, or about saints, who are the living exemplars from the existence of God, is an appropriate subject matter for Harikatha. Is Harikatha a Diminishing Art? Meera Grimes (also known as Balameera Chandra) is well known in India for her Harikatha performances. She is one of the leading artists in this field, an artist of the Music Academy, Air India Radio, and Television. The title 'Balameera' (little Meera), awarded by Pandit Jawaharlal Nehru, the late Prime Minister of India, is just one of several titles she has been bestowed for her outstanding talent. Meera is also a Bharata Natyam dancer and teacher. She began her Classical South Indian Dance (Bharata Natyam) training at the age of three under her mother, Smt. Neela Balasubramaniam, who founded the Nataraja Natya Niketan dance institute in Madras in 1940. By the age of five Meera gave her first public dance performance in Bharata Natyam. As well, she holds advanced degrees (she is a Sangita Vidwan) in Classical South Indian music. 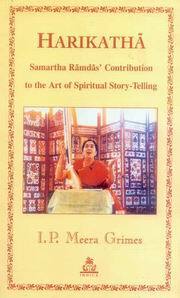 Meera is the spiritual disciple of Swami Vaidyanatha (Remaji). Recently Meera edited and published a book of Remaji's teachings titled: Offspring of God and Play of God or IP-IL Philosophy. It is a new presentation of Higher Wisdom with regard to the human soul, and it is in the form of a systematic exposition. The Relationship Between "I" and "Me"